Katherine Hand is the Global Head of Strategic Communications for HP’s Sustainability and Social Innovation Team. She develops and drives strategy to promote HP’s programs, commitments and progress on issues related to the planet, people and communities worldwide. Katherine coordinates global teams and key external partners to execute communications across social, digital and print media, company events, executive speaking engagements, internal channels and HP’s annual Sustainable Impact Report. Katherine has nearly 10 years’ experience inspiring audiences at Fortune 500 companies to change behaviour through compelling storytelling and reputational risk strategies. 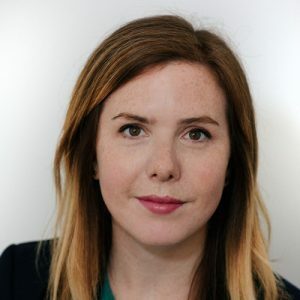 Previously, Katherine was Client Director with Context Group, a boutique corporate sustainability consultancy, where she spent three years leading communications and strategy projects for technology, food and beverage, apparel, and manufacturing companies both in New York and London. Prior to this, Katherine worked with B Lab in San Francisco, where she conducted audits of food, technology and service companies using the B Corp assessment. She spent the first four years of her career in the non-profit sector with a focus on shaping impact around education, economic and workforce development, reproductive rights, criminal justice and the environment. Katherine holds an MBA in Marketing, Entrepreneurship and Innovation from the Kellogg School of Management, where she was a Youn Impact Scholar and Chapter Leader of Net Impact. She also holds a BA in Urban Studies from Vassar College.